Maritime Blockchain Labs has announced the real-world testing phase for technology solution that enhances traceability and trust in bunker fuel supply chain. Maritime Blockchain Labs (MBL), a partnership set up between Lloyd’s Register Foundation and BLOC to explore the use of blockchain for the assurance and safety of critical infrastructure and drive new business models for the global maritime industry, announced today that its first demonstrator project, a fuel provenance register for the maritime sector that aims to provide trusted information about fuel origin, journey and characteristics, is set to enter a phase of further development as a key step towards commercialization. The next phase will involve the further development and scaling of the solution, capturing fuel deliveries and associated verified data into the system. It is intended that this will be undertaken by a consortium formed of ship owners or operators, fuel suppliers, port authorities and a fuel testing body and MBL is inviting interest from stakeholders within these groups to join and co-sponsor this next phase of work. It is expected to begin January 2019. 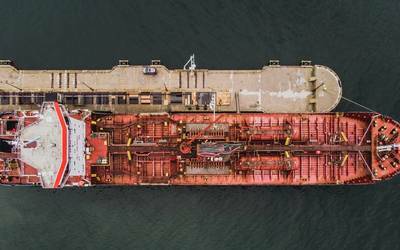 A prototype digital system, providing fuel assurance for ship owners and suppliers, was developed earlier this year together with a consortium including the International Bunker Industry Association (IBIA), LR’s FOBAS team, Bostomar, Heidmar, BIMCO, Goodfuels and Precious Shipping. The demonstrator phase of the project was funded by Lloyd’s Register Foundation. The successful development of a marine fuels quality tracing and compliance prototype involved testing in a simulated environment with the consortium in September this year. The demonstrator closed with the prototype being used for the manual capture of the world’s first end to end fuel transaction on a blockchain in the Port of Rotterdam. The solution also won the team the prestigious MIT SOLVE competition, in the category of coastal communities. MBL’s platform provides a chain of custody on quality and quantity documentation points for interested stakeholders within the supply chain, which in turn will provide a decision support system around marine fuels. This is achieved by using Hyperledger Fabric blockchain technology. This technology creates an immutable chain of custody of quality analysis documentation and specification of fuels from the various actors transacting and transferring the fuels throughout the supply chain. The analysis results of the fuel supply are then associated or linked to the specific transaction offering this fuel.